Spice up your cool fall mornings with these delicious seasonal pumpkin applesauce muffins with a sweet maple glaze! Use fresh pumpkin for the best results – and the most health benefits; you can make your own pumpkin puree easily by baking, steaming, or pressure cooking your pumpkin (she uses an Instant Pot in the recipe here), then scrape out the pulp and mash it finely or puree it in a food processor. And of course, homemade applesauce is the best! Preheat oven to 350 degrees. In a bowl mix eggs, sugar, applesauce, oil, and pumpkin. Beat by hand until light and fluffy (or use an electric mixer). Mix together flour, baking powder, baking soda, cinnamon, and salt. Add chocolate chips and stir into pumpkin mixture until combined. Fill prepared muffin tins (makes approximately 24 muffins or 18 muffins and one small loaf) and bake muffins for approximately 22 minutes, or until a toothpick comes out clean from the center. While muffins are baking, melt butter, combine with maple syrup. Slowly whisk in powdered sugar. 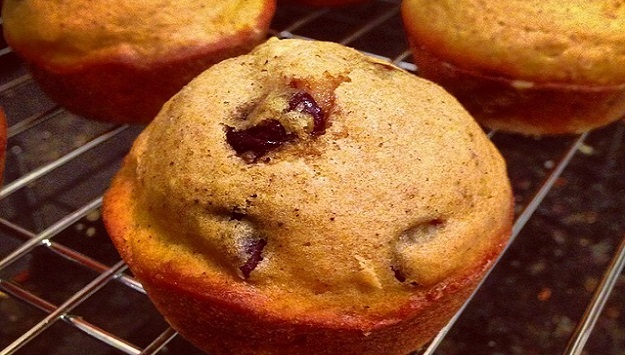 When muffins are slightly cooled, drizzle the glaze over the top. Try not to devour all in one sitting!